Goldman Sachs wants to grow its wealth management business -- which is far smaller than those at rivals Merrill Lynch and Morgan Stanley — and part of its strategy is to have its investment bankers help its wealth management unit win new customers, according to Bloomberg. 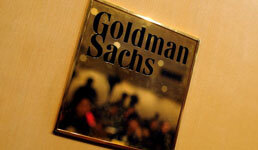 There are no requirements or expectations that entrepreneurs who use Goldman’s investment banking then have the firm handle wealth management for them too, but “it’s obviously a very positive introduction,” Christopher French, head of the firm’s private wealth management business in Europe, the Middle East and Africa, told Bloomberg at its recent annual charity forum. And the firm is focused on getting new clients, he told the news service. Meanwhile, Goldman’s private wealth management division works with investors, families, endowments and foundations who invest at least $40 million with the firm, Bloomberg writes. Yet Goldman’s share of the ultra high net worth market is currently just 2%. The firm manages $458 billion in its wealth division, according to a May 31 presentation cited by the news service. Morgan Stanley and Merrill Lynch each oversee more than $2 trillion, Bloomberg writes. But Goldman wants $5 billion in new revenue in the next two years — and 20% of revenue growth comes from the division that includes its asset management operations and its wealth managers, according to Bloomberg. On the other hand, Goldman advised on 363 initial public offerings worth a combined total of $30.4 billion last year, which gives it the largest global share of the market, the news service writes. Catching up with Morgan Stanley and Merrill Lynch by convincing its investment banking clients to sign up for wealth management isn’t necessarily what Goldman Sachs is aiming for, however, Danny Sarch, a wealth management recruiter, tells Bloomberg. The collaboration with investment banking isn’t the only way Goldman is growing its private wealth management operations, meanwhile. Last month, the company hired former NFL star Justin Tuck into the group, according to CNBC.com. Tuck — who after an 11-year professional football career graduated from the Wharton School at the University of Pennsylvania in May — was one of a select few, according to the web publication. In 2015, the firm took on just 3% of the 300,000 job applicants, CNBC writes.